Cue the music: Awesome Mix Vol. 1. I realize the parallel between Guardians and Star Wars may be reaching. Is Guardians really *that* revolutionary of a film? Not really. But that doesn't mean it isn't a wonderfully quirky and entertaining film. It's the expansive universe of Star Wars meets the action-packed quirkiness of The Fifth Element, with a dash of an Indiana Jones quest. Unlike many of the previous Marvel superhero films, Guardians capably walks the line between visually-stunning blockbuster action and hilariously savvy humor. It takes common elements from sci-fi and superhero films, building upon them to create something at once familiar and unique. The story follows the human Peter Quill (Chris Pratt), who after being abducted from Earth as a boy has developed into a not-so-infamous outlaw bent on making some quick cash, particularly from the macguffin of Guardians: a mysterious orb everyone in the universe apparently wants. Trying to avoid the evil Ronan the Accuser and his minions, his former partner-in-crime Yondu, and the Nova Corps, Quill finds himself in cahoots with a diverse cast of ruffians--Gamora (Zoe Saldana) is the daughter of Thanos and a highly capable assassin; Rocket and Groot (Bradley Cooper, Vin Diesel) are violent bounty hunters and social misfits as a talking/walking raccoon and tree, respectively; Drax (Dave Bautista) is a literal-thinking knife-wielding tank of rage. What makes this lineup stand out from previous iterations of the "we've got to work together as a team!" superhero movie (Avengers, X-Men, Fantastic Four, etc.) is their individual dysfunction and brokenness overcome by a sense of fellowship. While the other stories feature brooding loners (Logan in X-Men) and narcissistic one-man shows (Tony Stark in Iron Man), the Guardians feel much more like a band of misfits and outcasts, the rejects and losers of the world brought together for a singular purpose beyond themselves. Sure, X-Men also has the central theme band of outsiders, but they are trying to find peace and integration within their society. The Guardians just don't give a crap; while the X-Men want integration, the Guardians just want enough money to get away from it all. Quill is an orphan and abductee raised by a band of thugs. Gamora is also an orphan of sorts, adopted by the evil lord of the cosmos that destroyed her family. Rocket is the result of a science experiment gone wrong, an abused mistake left to fend for himself. Groot is a talking tree. Drax is fueled by the grief and rage from the death of his wife and family. As they work through their pain and confess their own brokenness, a community begins to form out of the remnants of their pain, a mosaic of broken pieces coming together to make a new whole. This team ultimately sacrifices their own individual agendas and risk their lives for the sake of a galaxy that has really given them nothing but pain, grief, shame, and bitterness. 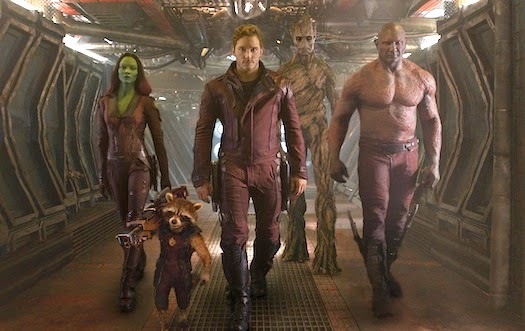 What begins as a group of selfish, isolated miscreants becomes...well...the guardians of the galaxy. I once compared The Avengers to the church, summarizing the plot as "a group of individuals must save the world from an evil invasion led by a deceptive spiritual being from another world." Allow me to make a similar comparison with the Guardians--a group of broken-yet-gifted individuals are united by a common mission to save the cosmos from destruction by a malevolent threat. Even a summer blockbuster with a talking gun-toting raccoon can point us to our need for a savior. Perhaps the contemporary appeal of these superhero films stems from the deep cry within our collective soul--we long for Someone to come and redeem this broken world for the better, making the wrong things right and bringing justice, peace, and salvation for all.